Pumpkins are everywhere these days! I love that we celebrate with pumpkins for Halloween and Thanksgiving. Pumpkins are super versatile- especially when it comes to crafting. Each one of these crafts are easy enough for even the littlest of crafters to make. Get the family together for some fun fall pumpkin crafting. 1. Painted Jack O' Lantern with Watercolors and Gauze: This cute pumpkin is the perfect craft for little hands. Experiment with how gauze absorbs and spreads with watercolors with this fun project from Make and Takes. 2. Pumpkin Apple Stamps: This project combines pumpkins and apples for one perfect fall craft from Frugal Mom Eh! Make a pumpkin stamp using half an apple. Dip it in orange paint and add some black jack o' lantern faces to complete the project. 3. Yarn Pumpkin: This pumpkin craft is yarn-tastitic! It's really easy which makes it a great craft for after-school play time. Grab some yarn, a paper plate, and get started over on Glued To My Crafts. 4. Paper Weaving Pumpkins: Teach your kiddos how to weave with this paper weaving pumpkin craft. It's simple enough that they will learn a new skill and also have lots of fun doing it. Make and Takes has the instructions. 5. Simple Beaded Pipe Cleaner Pumpkins: This is a great craft to practice those fine motor skills. Use beads to recreate all the many shapes pumpkins can take. Find the tutorial over on Make and Takes. 6. Mini Gumdrop Pumpkin Ornaments: These gumdrop pumpkin ornaments are fun to make and also tasty to sample! Your children will really love this colorful candy pumpkin craft from Make and Takes. 7. Yarn Pumpkins Using Balloons: I really want to try this craft project using yarn and balloons. It looks like such a cool craft and experiment to try with little ones. The finished product turns out amazing. Get the directions from One Little Project. 8. "Your Little Pumpkin" Handprint Card: Wouldn't a grandparent love receiving one of these cards from their grandchildren? These are so cute and sweet. Find the details for this pumpkin craft from Frugal Fun for Boys and Girls. 9. DIY Pipe Cleaner Pumpkins: Cakies shares this adorable, colorful, and totally simple pumpkin craft with us for fall. Gather autumn colored pipe cleaners and bend them into pumpkin shapes. You can even string them together to create a garland for decoration. 10. Wooded Pumpkin Halloween Decor: Make a set of these wooded pumpkins for your Halloween or Thanksgiving decor. 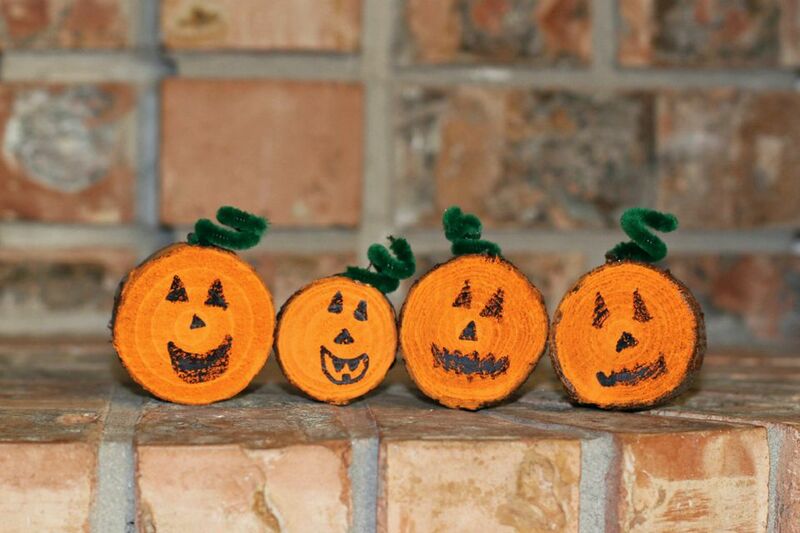 These little pumpkins from Make and Takes are absolutely darling. 11. Candy Corn Pumpkin: Try not to eat all the candy corn used for this kids craft from Education.com. Display these pretty candy corn pumpkins in your home for fall.